. . . be prepared . . .
Our Scout HQ, opened in 2004, has two halls (a low hall and a high hall), a shared kitchen and upstairs meeting room which has lift and stair access. The Hall is used by the Group every weekday evening for section meetings but you can hire it for birthday parties, fund raising events, meetings, weddings, family anniversaries etc at weekends and where we have a vacant slot during the week. If you wish to hire the Scout Hall, we charge an hourly rate for the halls with special rates for Saturday evenings. Please contact the booking secretary: Judith Francis Tel: 07923574990 to enquire and make bookings or email scouthallhire@sky.com. 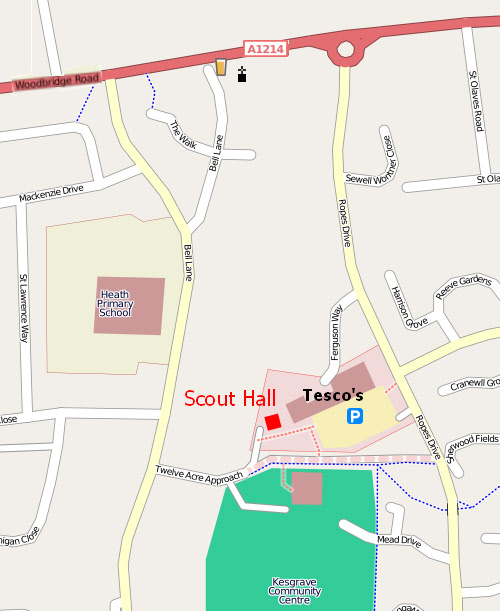 The new Scout Hall is located off Twelve Acre Approach or Ropes Drive via the Tesco car park. Image courtesy of Open Street Map [Post Code: IP5 1JF]. Regular hall hirers include: Cafe 66, Guides, Rainbows, Kesgrave Market, Kesgrave Stichers, Ballet Lessons, Keep Fit Classes, Taipan, Toodler Music and Movement, Bee Keepers etc. We also have hirings from local business, emergency services and local councils for meetings, training courses and elections. The kitchen comes equipped with two electric cookers, two microwaves, a self filling hot water urn, crockery and cutlery for approximately 50 people. The hot water urn should be turned on on arrival and takes around 20 mins to warm up and will serve around 50 cups an hour. Please turn it off when you leave. If you want to put up decorations there are eyelets along the sides of each hall to tie up balloons etc. Please do not use sellotape, only blu tack or masking tape on the walls. If you move the chairs and tables please ensure that they are put back tidily where they were found. If you use helium balloons please ensure that they do not escape to the roof. If they do then please ensure that the ceiling fans are turned off immediately so that the ribbons from the balloons do not get caught in the fan motors. This has already happened and will cost £200 for an electrician to come and rectify because we need a tower to reach the fan. We do allow bouncy castles in the high hall but care must be taken to ensure it doesn't damage or mark the floor. There are special sockets (red switches) at the ends of each hall for use by disco/sound equipment. Electricity is cut off to them when the fire alarm goes off so any sound systems stop working so people can hear the fire alarm. Please limit the use of smoke machines as it will set off the foyer fire alarm if the door in the entrance hall is open or opened when the level of smoke is high in the hall. This does happen fairly regularly and will mean you will have to evacuate the building and wait until the smoke level has reduced in the hall before you can re-enter. The First Aid Kit is located in the Entrance Hall on the wall by the disabled toilet. The accident book is in the back of the First Aid kit, which can simply be pulled out of the holder. There is a telephone in the office which can be unlocked using a key for the key box in the entrance hall. Depending on the event you are running we recommend that you keep the external doors locked to prevent anyone wandering in from outside. To do this stand outside with the door open, put the key into the lock and turn it clockwise until a click is felt, the handle will not now turn and when you go into the hall and shut the door behind you, the door will be locked from outside. The doors are all fitted with fire exits so even when locked from outside people can get out at any time and escape in an emergency. The padlock (if it is there) on the yard gate must be unlocked when the building is occupied, as it is the fire exit. The padlock should either be locked onto the gate or can be placed on the hook in the Low Hall above the alarm keypad. You may park in the yard but this area is shared with other users of the hall so please give priority to those who have equipment etc to unload. No cars should be parked on the square at the front of the hall as this is a pedestrian area only and the bollards should only be let down for emergency/maintenance vehicles. There are sweepers, dustpans and bins in each hall. A mop and bucket, hoover, extra T towels and bin bags can be found in the boiler room (key in the key box). Please put any rubbish in the skip in the yard. The blue bin is only for clean recyclable materials including card, plastic bottles and cans, any food, dirty items and black bags should be put in the green topped bin. Please separate your rubbish and take any glass bottles to the bottle banks in Tesco car park. NB However please bear in mind we are volunteers and may be on holiday, at camps etc so may not be available to deal immediately with your problem.